This is at least the third or fourth time I've read this book over the years, but I've been dying to re-read this series ever since I watched the movie. Tomorrow gets better with every read. For those of you who aren't familiar with the book, here's a quick rundown of the story: Ellie and Corrie, best friends since childhood, decide to get a bunch of their friends together for a campout deep in the bush before going back to school. Everything is going swimmingly . . . until they arrive home to find that the entire city is gone, no electricity, pets and livestock starved to death. Eventually, they discover that the country has been invaded, and their families are all being imprisoned by enemy soldiers at the Showground. They must decide whether they will try to wait out the war in their hidden campground or fight to take back Wirawee. This book never fails to tug at the heartstrings. Written from Ellie's point of view in flashback form, the reader really gets into Ellie's head and experiences the victories and trials along with her. 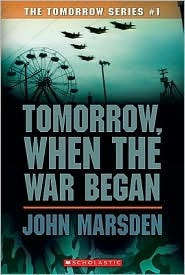 John Marsden is not afraid to make the characters as real as possible, nor is he unwilling to put them into harm's way. This is a terribly realistic portrayal of war and how this group of teenagers tries - sometimes successfully, othertimes not so much - to step up to the plate and fight for their country.